Since I have a food sensitivity to wheat, regular lasagne noodles are off the menu for me. Luckily this recipe is so delicious, I don’t even miss them! Even my husband couldn’t tell that it didn’t have “real” noodles in it. If you’re not actively avoiding wheat, grains, or eating low carb, replacing some of your grain intake with vegetables is always a nutritious swap. 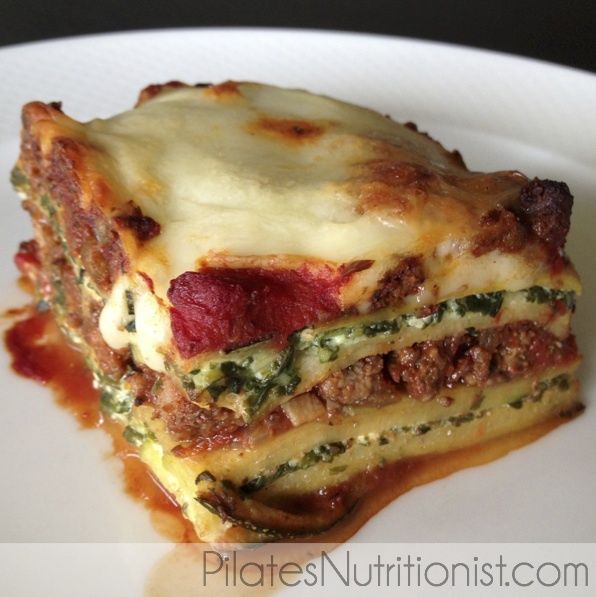 This low carb version of lasagne uses thinly sliced zucchini to replace the noodles. To further up the veggies, I add greens to the cheese filling. In this case, I use frozen spinach, but you can use kale, chard, or any other greens you have available. You’ll benefits from a few special kitchen tools for this recipe – a food processor and a mandolin. You’ll need the mandolin to slice the zucchini into paper-thin strips and the food processor for both the cheese filling and to finely chop the mushrooms. While I love quick dinners, I’ll be completely honest with you – this is not one of them! Plan ahead and prepare this on a weekend when the weather is foul. It’s worth it! 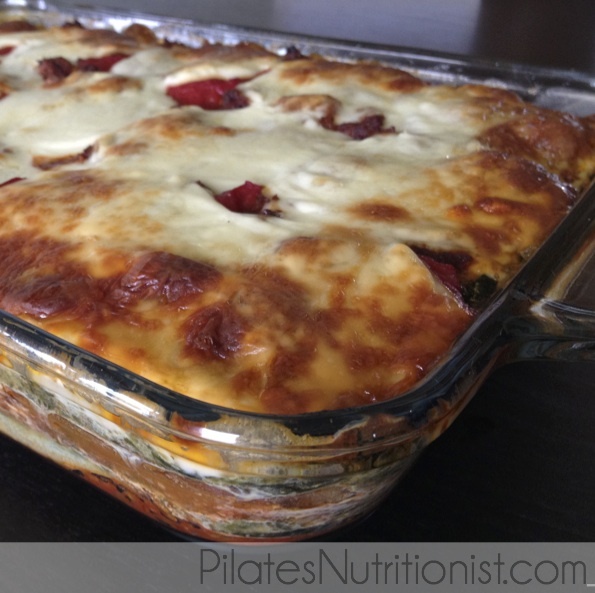 This low carb lasagne with zucchini noodles is a crowd pleaser and I bet your guests will never believe that it packs in nearly 7 pounds of vegetable goodness! Slice zucchini into strips using your mandolin. I use this one on the thin setting. It would be really tough to do this by hand, but if you have magical knife skills, I’m sure you could manage. You might even be able to use a vegetable peeler to make the strips, but I haven’t tested that out. Place zucchini strips on a large sheet pan, sprinkling each layer with salt as you cut them. Let sit for at least 30 minutes. This is crucial, as it draws out excess moisture from the zucchini (and seasons it!). Meanwhile, start preparing the meat sauce. 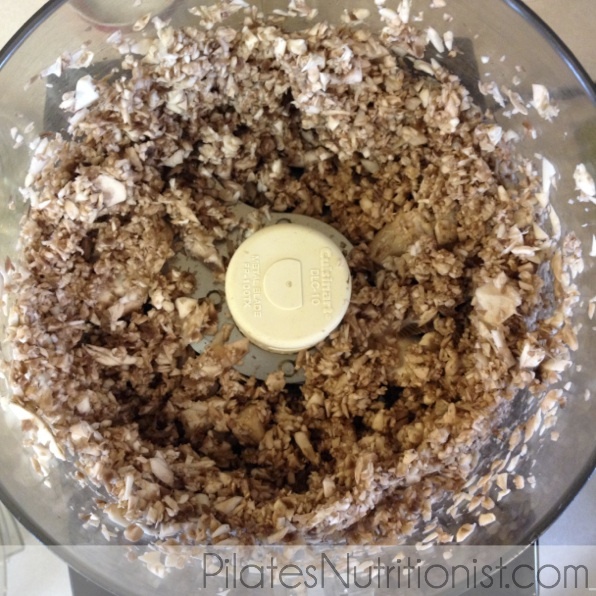 Begin by finely chopping the mushrooms in the food processor (or by hand). Brown ground beef in a cast iron skillet. 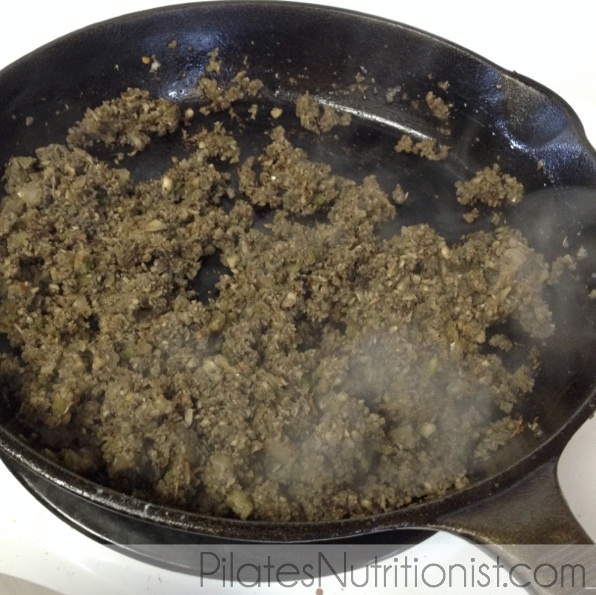 Remove meat from pan, leaving drippings behind. Brown the mushrooms in beef drippings on high heat, being sure most of moisture has evaporated. Reduce heat to medium and add onions and garlic to the pan to brown. You may need to add more fat (I use a combo of butter and olive oil). Finally, add marinara sauce to the pan to heat through and thicken slightly. Add beef back to the pan and remove from the heat. Next, make the cheese filling. Combine all ingredients in the food processor and whiz until combined. Dry zucchini slices by laying out on a clean kitchen towel or paper towels. Blot dry before assembling the lasagna. Spread a thin layer of meat sauce on the bottom of a 9x13 inch glass pan. Then begin assembling by alternating layers of zucchini (your “noodles”), meat sauce, cheese filling, and finishing with a layer of parmesan and mozzarella cheese. Bake uncovered in a 375 degree for 45-60 minutes, until the top is brown and bubbly. Let stand 20 minutes before serving (if you can handle it!). NOTE: Why grass-fed beef or eggs from pastured chickens? Finely chopped mushrooms in the food processor. Browning the mushrooms in beef drippings. You can’t believe how good these taste! They really increase the flavor in this recipe. Then you’ll love the delicious vegetable recipes in my ebook, “Veggies: Eat Them Because You Want To, Not Because You Have To”. Grab your copy below. It’s FREE! Let me know how it turns out, Viki! Thanks! Its getting chilly here and this is something I love cooking in the Fall/Winter! Plus it looks yummy and healthy…Win, Win! Just in time for fall, Melissa! YES! I’m all about the zoodles and haven’t tried lasagna yet. It looks sooo good- with mushrooms too. My new dish to try for the week- thanks! I’m with ya, Amy! I love making noodles out of zucchini! It’s just as easy as opening a package of pasta (with the tool I use) and they cook in less time. Other than the salting process for the zucchini, you can make many tweaks to this recipe and I’m sure it’d still come out fantastic. This looks absolutely delicious Lily! Such a beautiful job…both with the dish and the photos. I’ll take compliments from a chef any day, Silvia! Thanks! This looks amazing! I’ve never added ground mushrooms to my sauce either but I’m excited to try it. Thanks for another awesome recipe, Lily! Report back when you try the recipe, Anne. This sounds great! I’m trying to lose some weight for my wedding next year and trying to cut down on carbs and eat more veggies! I was just wondering what the carb value would be per serving of this yummy lasagne? So my hubby knows how much insulin to take. Thanks ?